T-Mobile USA has certified u-blox's LTE Cat NB1 SARA-N410 module to run on its new NB-IoT network, the first NB-IoT network to launch in the US. At an ultra compact 16 x 26 mm, SARA-N410 supports ultra low power consumption, making it ideal for cost optimized long-term solutions required by many IoT applications. Those include utilities such as gas, water and electricity metering, smart cities for instance with street lighting, parking sensors and waste management, smart buildings with building automation, HVAC and access control, as well as industrial monitoring and control. Critical firmware updates can be delivered securely with u-blox proprietary uFOTA (firmware over the air) client/server solution that uses LWM2M, a light and compact protocol ideal for IoT applications. This enables customers to maintain the hardware over the full lifetime of the product for future enhancements to features and functionalities, especially in the case of crucial applications running on devices deployed over long periods of time. SARA-N410 also supports non-IP data delivery, a more efficient way of transmitting data for throughput-constrained low power wide area (LPWA) technologies. 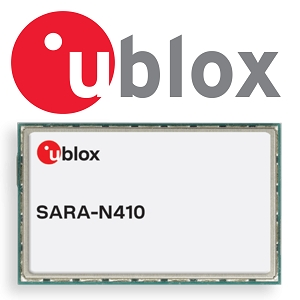 SARA-N410's nested design provides easy migration between u-blox 2G, 3G and 4G modules, while enabling future-proof, seamless mechanical scalability across technologies. With a temperature range of -40 to +85°C, the module supports Power Save Mode (PSM) and Extended Discontinuous Reception (e-DRX), which can extend battery lifetime up to 10 years. 3GPP Coverage Enhancement permits the module's connectivity to reach deeper into buildings and even underground when compared to other air interface technologies such as GSM or Cat 1. For more information about SARA-N410, click here.